Our Gourmet Perle Chef's Collection multipack contains delicious recipes in Gravy with Turkey, Tuna, Duck and Lamb. 100% complete and balanced nutritional pet food for adult cats (aged 1 to 7). A tempting variety of flavours to tempt your cat's taste buds. Served in 85g pouches to keep every meal fresh and convenient. Packed with essential vitamins and minerals to keep your adult cat healthy. No added artificial colourants, flavourings, preservatives. You enjoy feeding your cat delicious recipes made from simple and high quality ingredients. 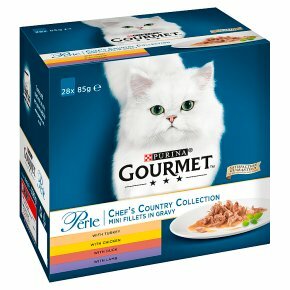 That is why GOURMET Perle has created Mini Fillets in Gravy: thoughtfully selected ingredients cooked with care for exquisite flavour, cut in fine mini fillets and served in a delicious gravy to delight the refined palate of your cat. All GOURMET Perle varieties have no added artificial colourants, preservatives and flavourings. Mini Fillets in Gravy from GOURMET Perle, simple and refined creations for an irresistible taste experience every day.